Mom wanted to put together an album of photos from last year to take with her to China. Here are the photos I chose for her. It was interesting to look at everything just from 2006. There are a few on there from this year, but not too many. The hard drive that had all the photos on it got dropped on the floor and it is broken. That hurts. We are heading to St. Louis tomorrow for Passover. I think this might be the third year in a row that we are going to Aunt Jen's. We'll talk about Hannah's Bat Mitzvah, which you'll play a big part in. Jack got his Bar Mitzvah date yesterday. I think it is December 19, 2009. Can you believe they schedule these things so far in advance. Everything has gotten so complicated. I'll definitely put up some photos from St. Louis. Jack going to go with Aunt Jen, Uncle Dan and Hannah on a tour of important civil rights places in the South, like Selma, Alabama. Mom and Joe and I will be heading home 'cause we gotta work. We went to the JPDS Purim Ball last night. The Mintz's, Moskowitz's and Susan took out an ad in the program remembering you. That is so nice of them. There was an auction and we bought a locker. That means we get to put a plaque on one of the lockers at school. I told Mom that we should just put something that includes your name, and Jack and Joe's names on it. Something like, "This locker smells because Henry, Jack and Joe Strongin Goldberg had their stinky stuff in it." I don't know if they'd go for that. No-one would want to use it. We'll see. The guest of honor last night was the Mayor of Washington, DC. His name is Adrian Fenty. You met the old mayor, Anthony Williams, at Glover Park Day one year. This new guy is young, smart and a really hard worker. He hasn't been on the job too long. This is a picture of Mom and Caryn Pass talking to the Mayor last night. That is the back of Mom's head. On Friday, the Mayor came to school and talked to JPDS students and to students from schools nearby who were invited. Jack asked the Mayor how he likes being mayor. The Mayor said it is fun. This was a story from the newspaper about the visit. You can see Jake on the far right in the top photo. When I click on this and see a big version of the story, I can see Maxwell on the left of the Mayor and David Lane to the right of the Mayor in the bottom picture. I gotta figure out how to get the photos to be bigger without clicking. Cousin Catherine and Tim and their daughter Sarah came over for brunch yesterday. Catherine is going to have a baby soon. You can just see the bottom of her belly in this picture. I explained to Jack that Catherine use to live in his room. You were in what is now Joe's room and Jack hadn't been born yet. We went outside and shot some hoops before we went to Joe's baseball practice. Joe's practice was at a place called, The Heights School. It is in Potomac where I grew up. The Heights is on land that used to be home to a day camp I went to called Camp Inverness. Jack is going back to Camp Ramah this summer and Joe is going to the sports camp at St. Albans. I remember when Cousin Michael went to the camp at St. Albans and you and I dropped him off there one day. Joe likes basketball almost as much as baseball now. Jack is practicing basketball and getting really good. I want to get a portable backboard to wheel out into the alley... I think. I need to scope it out better to see if it'll work. We do have the court only a hop, skip and a jump away at Stoddert. Joe is schooling Tim right there. Jack went up against him on the Wii in the basement. Joe insists on wearing that same shirt every day. It is a hand-me-down from Cousin Sam, who is turning 8. Jack and Joe went to his birthday party on Saturday. I find it a little hard to believe that Sam is older than you ever were. Sam's a good kid. I like him a lot. 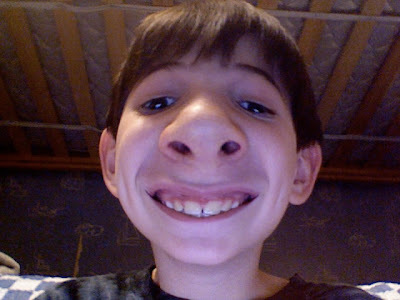 I found Jack's new school pictures buried in his backpack. 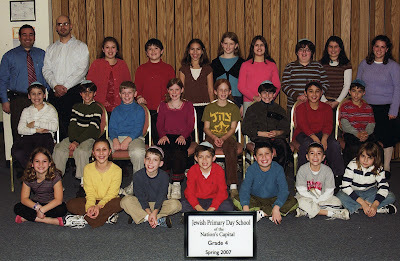 He is third from the right in the second row. The only reason I am pointing out his exact space is because he looks just like his friend Maxwell, who is second from the left in that row. They look a lot alike. On Wednesday night the two of them are going with Jake to a Wizard's basketball game. The university is investigating, said Tim Mulcahy, the U's vice president for research. However, he said nothing so far has erased the U researchers' original findings that a certain kind of adult stem cell can produce multiple types of cells, proteins and tissues in the body and holds extraordinary potential for future treatments. "There's no reason to think any differently about the work up until this point in time," he said, though the scientific community will make the ultimate determination. This is the U's second inquiry in the past year regarding potential flaws in the stem cell research. The stakes for resolving these errors are high for the U, which built its reputation as a powerhouse of stem cell research upon Dr. Catherine Verfaillie's initial discoveries in 2002. Until then, it appeared only stem cells from human embryos were capable of producing all of the different cells and proteins in the body. Verfaillie's research suggested these special stem cells, or multipotent adult progenitor cells (MAPCs), from adult bone marrow could be reprogrammed to produce multiple cell types as well. The discovery had political ramifications, giving hope to people who opposed embryonic stem cell use on the grounds they were derived from the destruction of human embryos. They often cite Verfaillie's research as part of their proof that embryonic research is unnecessary. The U has already acknowledged a similar error in which stem cell data for a study published in Nature in 2002 was also published in Experimental Hematology, even though the latter article dealt with an entirely different experiment. In February 2006, New Scientist brought initial concerns about that duplicate data in the two journals to Verfaillie, who then informed U leaders. In August, an expert committee validated the concerns but concluded they were honest mistakes. However, the reviewers found separate problems in the process the researchers used to identify the MAPC cells, calling the process "significantly flawed." Subsequent reviews by two stem cell experts have determined that these flaws had no impact on the Experimental Hematology study but may have weakened conclusions published in Nature. Verfaillie has written letters to the two journals about the problems with the research, and at least one plans to publish her explanation. Beyond the errors, Verfaillie's research has generated controversy because other scientists have had difficulty repeating her results, even when they traveled to the U to copy her team's methods. That difficulty is what drew the curiosity of New Scientist reporters in the first place. Verfaillie is now at the Catholic University of Leuven in Belgium but remains on the U faculty and active in its stem cell research. She recently authored a stem cell paper along with an influential skeptic, Dr. Irving Weissman of Stanford University, showing that these stem cells could create all types of blood cells. However, the research didn't affirm the U's earlier claim that the stem cells could create other cells and tissues outside of the blood system. The U is continuing plans to use MAPC cells in clinical trials, Mulcahy said, because those plans are based on progress with MAPC cells at numerous institutions. Initial trials will likely test the cells in patients with Fanconi anemia, a genetic disorder that can cause leukemia and is often fatal. Jeremy Olson can be reached at jolson@pioneerpress.com or 651-228-5583. Mom and I met with a man from Children's Hospital the other day and she explained to him how there are only about 1,000 known cases of Fanconi anemia in the world. Here is a newspaper story about a boy way far away who has FA. His daddy is from Saudan, and they have terrible things going on in that country. His mom is from Taiwan and that is where he is going to have his transplant. Mommy is leaving for China in a few days. That is right next to Taiwan. It is on the other side of the world. Joe keeps asking her not to go 'cause he is going to miss her so much. She is going to have a great time and I think Joe will really enjoy all of the pictures she will take and the presents she'll bring back. A five-year-old Sudanese boy suffering from Fanconi Anemia experienced a pleasant Lunar New Year in central Taiwan last month thanks to the efforts of a Taiwanese woman and her Sudanese husband. The boy, Elnour Eltayeb, who has eight brothers and sisters, was diagnosed with Fanconi Anemia at the age of two. One of Elnour's older brothers died of the same disease, which is genetic, several years ago. 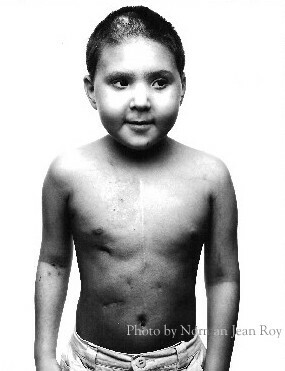 Elnour's only chance for survival is to have a bone marrow transplant. Tsai Yi-man (蔡苡蔓) and her husband heard about the boy's illness when they visited Sudan last year and decided to help him. After the couple returned to Taiwan, they contacted China Medical University Hospital in Taichung for medical advice and assistance. The boy, his parents, an older brother, and a younger sister traveled to Taiwan late last year, staying for free in dormitory at the Taichung hospital. While in Taichung, the health of Elnour's older brother, who is diagnosed with the same disease, unexpectedly took a turn for the worse and put him in critical condition. The brother received a bone marrow transplant over a month ago. Medical bills have as a result doubled from NT$3 million to NT$6 million, but the family has only managed to raise half that sum. Elnour's doctor, Wu Kang-hsi (巫康熙), said that the boy's condition was currently not critical, which disqualified him for an immediate transplant. The hospital is monitoring his condition. To cheer the family up, the hospital's deputy superintendent Peng Ching-tien (彭慶添) has encouraged them to participate in activities organized by the Taiwan Thalassaemia Association, which provides support to people with Thalassaemia -- a kind of anemia -- and their familes. Chen Li-ming (陳立明), who is the association's chairman, took the family to a restaurant to celebrate the Lunar New Year together. At the dinner she gave Elnour a red envelope -- traditional during the holiday -- as a symbol for luck and a wish for good health from the people of Taiwan. Isn't this nice. I am going to help Mom set up a blog for the Hope for Henry website so she can post great emails like this, photos, videos and other good stuff. My name is Jamie. This summer I have been selected as the charity chair for the DC Potomac Kickball League, a division of the World Adult Kickball Association. Each summer we choose a charity in the local community that we feel can use the funds we raise over the season. This year we would like to contribute our season's collection to Hope for Henry. We feel that your organization keeps in spirit with our league and is doing wonderful work for children. Could you please send me some information about how to contribute funds? Our aim is not only to raise money, but to educate our players about the charity and encourage them to continue on with their charitable endeavours after the season. If you have any information you would like us to distribute about Hope for Henry we can definitely do that as well. Finally, I was wondering if you took used electronics (like old gaming systems) as donations as well? I was thinking about organizing a drive at one of our events. Thanks you so much for the great work Hope for Henry is doing. We at DC Potomac only hope that this summer we can give a little back as well. I would like to kick off our efforts next week at our Team Captains Meeting, so any information you could share with me would be fabulous! This study was just published by University of Minnesota. I think what it means is they are having success with transplants that don't pretreat the patients with radiation. Remember how you had to go into that room where no-one else could go and sit so still. Most kids your age needed to be sedated. You listened to music. You were the youngest kid ever to have TBI there without anesthesia. The radiation really messes you up. Especially if you have FA 'cause your cells are so fragile to start with. This is good news for other kids needing transplant. I wish they had learned it earlier. Fludarabine-based regimen without irradiation is effective in patients with Fanconi anemia who are undergoing HLA-matched related donor hematopoietic cell transplantation. According to a recently published report from the United States, "To potentially reduce late effects of malignancy, chronic graft-versus-host disease (GVHD), endocrinopathy, and infertility in patients with Fanconi anemia (FA) undergoing HLA-matched related donor hematopoietic cell transplantation (HCT), we developed a regimen using fludarabine (FLU), cyclophosphamide (CY), and antithymocyte globulin (ATG) followed by infusion of T-cell depleted (TCD) bone marrow (BM) or unmanipulated umbilical cord blood (UCB). "GVHD prophylaxis consisted of cyclosporine and short Course methylprednisolone. Between April 2000 and June 2003, 11 patients (10 aplastic anemia (AA), 1 myelodysplastic syndrome (MDS)) underwent HCT using this regimen. Stem cell sources were BM and UCB in eight and three patients, respectively." "All patients demonstrated primary engraftment. Median clays to neutrophil and platelet engraftment were 11 days (range 9-21) and 38 days (range 19-381), respectively. "No patient developed GVHD after primary HCT. The patient with MDS relapsed with AML and a maternal donor recipient experienced secondary graft failure," reported P.L. Tan and colleagues at the University of Minnesota. The authors continued, "For the nine FA patients with AA who underwent HLA-identical sibling donor HCT, the Kaplan-Meier estimates of overall survival and event-free survival (EFS) at 2 years are 100 and 82%, respectively, at a median follow-up of 2.9 years (range 1.9-4.8)." "A FLU-based, nonirradiation approach is effective for FA patients with AA Undergoing HLA-identical sibling donor HCT," Tan concluded. Tan and colleagues published their study in Pediatric Blood & Cancer (Successful engraftment without radiation after fludarabine-based regimen in Fanconi anemia patients undergoing genotypically identical donor hematopoietic cell transplantation. Pediatr Blood Cancer, 2006;46(5):630-636). For additional information, contact P.L. Tan, University of Minnesota, Dept. Pediatrics, Blood & Marrow Transplant Program, MMC 484, 420 Delaware St. SE, Minneapolis, MN 55455, USA. Mom and I saw Dr. Shad last week. She told us that Kabir died. It was nice that he was able to get home. We have a lot of pictures of Kabir that we need to send to his family. I think they'll want photos of him the way I want photos of you. I went to do something on the computer this weekend and part of it was making a funny noise. It is broken. Jack told me he dropped it by accident. The part that Jack dropped is called an "external hard drive" and it has all of our photos, videos and music on it. I was pretty bummed. But I know that there are places out there where they can recover everything off the drive. It is a hassle, not a tragedy. Speaking of photos, check out the email I got this morning. I wasn't making this up. 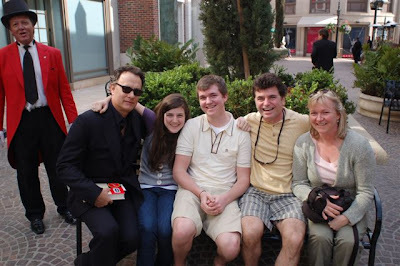 Here are the pictures you took of Tom Hanks and my family. Thank you very much for being there it made our week. I am sure you told lots of people and they may not have believed you, well here is your proof. We just got back on Friday and wanted to send these pictures as soon as possible. Please let me know if they come out O.K. or not, I will send it in a different format. And if you ever plan to come to Toronto, Canada, drop me a line ... I will take a picture of you and your family....I can't promise celebrities though. Thank you again for your kind offer to take the picture, it was a great memory and a great story. 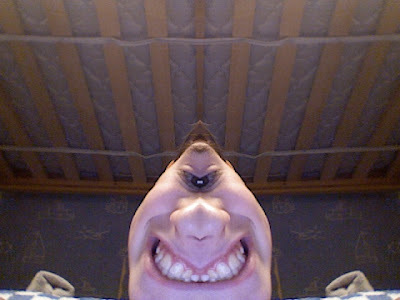 Jack made these pictures on a Apple laptop I borrowed from work. He wants a computer like this. Cousin Michael has one. These are pretty funny looking, dontcha think. I am in the airport in Long Beach, California waiting for my flight home. The idea is to take the plane home through the night and wake up in Washington. There is an Eagle Festival tomorrow at Blackwater Wildlife Refuge that we are going to. I really like this airport. I come here a lot. I've been here 3 times in the last 6 weeks. This airport is small and old-timey. Tonight I sat outside on the balcony here and watched airplanes and helicopters take off and land while the sun was going down over the runways. It was pretty. Balconies are fun. They have them at Adas Israel and the Uptown Theatre. Must be an old-timey thing 'cause those are old buildings, like this airport. I also like that they have plain old stairs to get on and off the airplane. You can actually sit on the balcony and watch someone get on their airplane. In Washington you can never get that close any more. Another thing I like about this airport is there is a golf course right next to it. When I get here early I stop there and hit balls at the driving range. I have a blister on my hand from doing that last week when I was here. I need to bring a glove with me in my briefcase. It's been a hard week: first the funeral and then I was in New York and now Los Angeles. Zach was a huge Herbie the Love Bug fan and there is a Herbie VW Beetle in the driveway of his house. When we went over for shiva the 2 things that hit me were that car and the mechanical chair that helped him get up and down the steps. I think it will be a very, very long time before his mom and dad do anything about those things. I hope Mom and I can help them if they need it, but I think they are just going to be super sad for a long time. We got a lot of different bad news and a little good news this week about other friends and things. I'm tired and I can't wait to get home. Been thinking about you a ton. I love you. I came out to Los Angeles for work and I am writing this to you using my telephone. Pretty cool. I had lunch today with my friend Glen in a part of town called Beverly Hills. After Glen left I decided I would take a little walk around. It is very warm and sunny. It was 12 degrees in Washington early yesterday morning. I walked through this place that seemed like a nice shopping mall with the exception that it was outside. I came up to a family who were about to take a picture of themselves. Actually, the mom was taking the picture and her husband, son and daughter were sitting in front of her on a bench. It kinda reminded me of a lot of the pictures that I take - the 3/4 family shots, or counting you, the 3/5 family shots. I walked up to these people and asked if they wanted me to take a picture of all of them together. They said that would be nice. I took their camera and ran away. No, I asked them if they wanted the picture to be close in just of them, or did they want me to include some of the background so they would know they took they picture in Beverly Hills. The stores are very fancy looking. There aren't a lot of other places like Beverly Hills. Just then a stranger came up and sat on the bench next to them and asked if he could be in the picture too. I said that I should widen the shot so they could include this man and really know the picture was taken in Beverly Hills. The man, it turns out, was Woody - or the actor who was the voice of Woody. His name in real life is Tom Hanks. He is a big movie star. He was in a baseball movie about girls who played baseball during World War II. I don't know if you ever saw a movie with him in it. He was also in a movie called Forrest Gump. Maybe you saw that. He was very nice, just like Woody. It was a big treat for that family to have him in their picture. I made sure I took a bunch of shots. It was pretty cool. Oh, I forgot to tell you this... Jack has memorized Pi to 60 places. He was gunning for a hundred, but I think that may have been too much. He can also name all of the states in rapid succession from memory. That means he can say them really fast almost without taking a breathe. I can't memorize anything so I am in awe of Jack. Your brothers are amazing, and amazingly different from each other and you. I want to take some time in the next few weeks and explain to you my new job. It is kind of "out there." We use fMRI's to look at people's brains while they are watching TV ads. It is a long way from the radio business, but it is another new technology and I like that. This weekend when we were at Georgetown Hospital, I walked through the Radiology Department and remembered all of the CAT Scans and MRIs that you used to get. They have a pretty thick file on you. Maybe I should go grab all of that film before they toss it. That could become part of my digital Henry project - Henry Inside and Out. This is a TV commercial that I am in from a long time ago. I was walking down the street in Austin, Texas with my friend Edmond. The people doing the commercial asked me what I though about a McDonalds hamburger being only 49 cents. I thought that was "Excellent." I wonder what people's brains would think about me. Maybe the best part of the commercial was the "Premiere" party my friends and I had to view the ad for the first time. We catered the party with McDonalds hamburgers, french fries and a keg of beer. I'll write you more about what I am doing soon. I have the worst headache. It is from crying all morning. The funeral was beautiful. All of Zach's family said something. I don't know how they did it. I thought Mom said something at your funeral, but she reminded me that actually it was Aunt Abby and Uncle Andrew reading the eulogy Mom wrote. Zack's sister, Janie, who was in your kindergarten and first grade class, told a very funny story about when she and Zack were on a water ride. She was extremely brave. Mom told me that she used to write you big cards with rainbows on them. Zack was buried about 20-30 yards away from you. It was a really nice spot right on the edge of the trees. Sid said that it was almost the place they got for you. He also told me that he thought about you a lot through the ceremony because the way everyone described Zack it sounded like you - happy, full of life and kisses, never complaining, wise beyond your years. Elaine had it really rough. Both you and Zack were very special students for her. And she lost you both. I am back at work and I have a lot to do but I feel exhausted. It was nice to visit your grave. I'm not sure what happens after you die, but keep an eye out for Zack and take good care of him. Sunday night might be my favorite time of the week. Tonight I got to sit in the bathroom and watch Joe take a shower. I tell him a number, letter or shape and he writes or draws it with his finger in the mist on the shower door. All the while he is humming "Iron Man" by Black Sabbath. Your brothers are interesting pieces of work. We are going to Zack Klein's funeral tomorrow. He was an incredibly sweet kid. I feel terrible for his parents and his sisters. I called to see if I could sit with his body but they had enough people, which is a good thing. I sat with Grandma or Aunt Ida, and parents from JPDS sat with you. You stay with the body at the funeral home and read psalms so they are never alone. On Friday, March 2, 2007, of Bethesda, MD. Beloved son of Greg and Cynthia Klein; beloved brother of Janie and Lily; cherished grandson of Marty and Stephanie Klein, Audrey Horowitz and of the late William Horowitz. He is also survived by many other loving relatives and friends. Funeral services will be held on Monday, March 5 10:30 a.m. at Congregation Beth El of Montgomery County, 8215 Old Georgetown Rd., Bethesda, MD. Interment Judean Memorial Gardens, Olney, MD. Shiva to be annouced at service. If you would like to make a donation in Zachary's honor please contact A-T Children's Project at: www.atcp.org Arrangments by HINES-RINALDI FUNERAL HOME INC., Under Jewish Funeral Practices Committee of Greater Washington. The funeral for Zachary Klein, son of Cynthia and Greg Klein, brother of Janie and Lily Klein, will be held at Beth El at 10:30AM tomorrow (Monday). Internment immediately following at Judean Gardens. Also on Friday, Cousin Adam and Lori had a baby. His name is Nathan Goldberg. I wanted to name you Nathan Goldberg, but Mom said "no way." My grandfather was named Nathan. I thought Nathan and Nate are good names. Mom thought otherwise -- so you were Henry. This has been an incredibly full weekend. Cousin Ron -- Nathan's uncle -- Diane, Zoe and Mia all came over for brunch on Saturday morning. Bill, Cristina, Sophia, James and Isabel came over too. It was crazy and fun. They all live so close in Virginia, McLean and Arlington, and we hardly see them. We made a deal that we'd all get together for brunch at least once a month at someone's house. On Friday night, Sid, Linda, Ari, Helaine, Jake, Abby, Susan, Simon and Alex all came over for Shabbat dinner. We are truly one big, funny family. Last night we went to the Megillah reading at Adas Israel for Purim. Everyone got dressed up. I think my favorite was Jake wearing a cheerleader uniform. Jack is in the sweatshirt, Joe is a Redskin, Max is an IDF soldier and Ari is just looking suave. we went to Georgetown for a Hope for Henry Superhero Party. 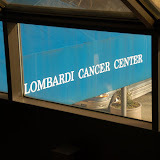 It was in the atrium outside of the outpatient clinic at the Lombardi Center. There were a lot of families there. They came to the hospital on a Sunday which is saying a lot. Mom did such a wonderful job that she definitely made it worth the trip on a "non-clinic" day for all of the families because the kids had a great time. Here is a slideshow of the event. After everything was in full swing, we went up to the 5th floor to bring some of the party to the kids who couldn't leave their rooms. While we were in the hallway, a mom and her son were walking out but stopped to introduce themselves. She said that Hope for Henry had really made a difference for her son. We gave him an XM radio. The mom told us that she and her son had read an article about you. The son was cured of his cancer, and they were leaving the hospital that very moment to go home for good. Talk about timing. Everyone started crying. It was an incredible moment. There was another amazing moment right after that. Mom went into the room of a kid who had just come in minutes before by Medstar helicopter. The pilot and the EMT workers were still on the floor filling out paperwork. The kid had brought a Spiderman toy with him on the helicopter, so you can guess how excited he was to get a bunch of other Spiderman and superhero toys and treats. A nurse was in the boy's room and when he found out that Mom was your mom, he said that "Henry's spirit is truly living on through all of the good work of the Foundation." He said a ton of really nice things about you and about the Foundation. 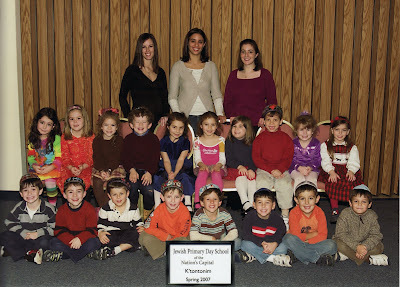 This is Joe's class picture. All the boys look pretty much the same to me. He is in the bottom left corner with the big goofy smile. He just got a really good report card. Both Jack and Joe are doing really well in school. I am proud of them and feel incredibly fortunate.